We are fans of design, if you haven’t gathered by now. I have the book By Hand And By Eye published by the Lost Art Press which is fabulous. This is a short video from Jim Toplin one of the authors. I really like how he ties things into music. It really makes you look at things differently be it a piece of furniture or a building. This entry was posted in Things we Like and tagged By Hand And By Eye, Jim Toplin, Lost Art Press. Bookmark the permalink. I’ve looked at Tolpin’s site and his supplementary materials for the book enough to think that he really has no idea what he’s talking about. It’s basic 9th grade geometry with no additional insight. No one has ever needed a compass to lay out a 2 x 3 or a 3 x 4 rectangle. If you look at the Blake image of Urizen that is on the wall in the video it is obviously in the ratio of 1 to the square root of 2. Tolpin doesn’t even seem to realize that while he blabbers on about whole number ratios. Ratios like that, not whole number ratios, are where you need the compass. None of that stuff is difficult but obscurantists have made a living off of “sacred geometry” garbage for a long time. Tolpin seems to miss out on the most obvious stuff and conflates what craftsmen working in various trades would have done with what what architects and other highly educated academic types would have learned as the basis of pretty deep theory about their practice. They just aren’t the same thing and never were. Read the Power of Limits if you want a much better book on the subject, but also keep an eye out for the tremendous amount of BS that book is full of. Thank you for your comment. As I am a relative neophyte in this area I am not able to comment on your opinion of Toplin or his book. I am also not sure why the ratio is one to the square root of two as I had not come across this before. I have ordered the Power Of Limits as you suggest though so with luck things will get clearer. I first heard ‘form follows function’ as a child used by an old bushman as we cobbled together what we needed with what we had, its amazing what you can do with fencing wire and a Cobb & Co hitch. While he meant ‘it doesn’t matter what it looks like as long as it works’, which is true to the point of necessity, there are many aesthetically pleasing buildings of necessity scattered around Australia made this way, one or two built by this bloke with nothing more than an ax, fencing wire and a pair of fencing pliers. I like it when these two things are not mutually exclusive. When a craftsman makes/designs something that is at once fabulous to look at as well working/functioning as needed to, be this a hand tool by John Economaki, a piece of furniture by Fred Ward, the new UTS building in Sydney or a Cobb & Co’d shack in the Australian high country. I am also fully aware that mother nature with the gift of time is far and away the best at this. My father, DOD, has a gift for words and language that I unfortunately didn’t inherit. I can appreciate those who do though and you were spot on thinking that I would appreciate the article from the Guardian. While I was reading it it made me think of Waterlog, which is one of my favorite books, and like this article something you would read as much for how the words are used as for what it is saying. And what do you know Waterlog cracked a mention. So thank you for that. I think I will get Landmarks as well. Imagine or better yet draw a square with two edges horizontal and two edges vertical. Extend one of its edges upwards a ways, lets go with the left side so I can explain more easily. Place one point of your compass/divider at the lower left hand corner and the other point at the upper right hand corner. Leaving the first point in place, swing an arc with the second point to find where it hits the extended left side. Draw a horizontal line at that point and extend the right hand side of the original square and you will now have a rectangle that you will find in a lot of art. By the Pythagorean Theorem the diagonal of the square is the square root of the sum of the squares of the sides. 1 squared = 1. 1+1 = 2. The diagonal = square root of 2. Therefor the ratio of the horizontal edges of the new rectangle to the vertical will be 1 to the square root of 2. Things to play with: What is the rectangle you get when you subtract the original square from the root 2 rectangle you build on it? What do you get when you start subtracting squares from that rectangle (squares based on the length of the remaining short side)? What are the proportions of the last rectangle left after all the full squares are gone? Try the same with the root 3 rectangle. There is a lot of mystical BS about the perfection of the golden rectangle, but it is interesting for some real reasons. To draw that, follow a process similar to drawing the root rectangles, but put the pivot point of your compass at the midpoint of the first square’s edge and swing an arc from one of the far corners. In that case, the rectangle left after you subtract the original square has the some proportions as the whole square. Cut a square out of the smaller rectangle you get the same thing again which repeats forever. Play with that a bit until you either discover somethings on your own or reach a dead end. Send me an email at some point and I’ll send you some stuff to help you understand more. If you want to challenge yourself a bit, print a copy of this out and see what happens when you use your compass on it. It has a very deliberate geometric structure. http://spaightwoodgalleries.com/Media/Old_Masters/Durer/AD_LP_Christ_Carrying_Cross_Proof.jpg Search for Durer’s Large Passion form the rest of that series of prints. See if you can find the same geometric framework in the others. Nightshift over for the week, now to exercise my brain. I love a challenge and getting my brain out of its comfort zone. All right, you have had a few days. Probably super busy days with no rest, walking uphill both ways through the snow (American joke(yep, I also know you lucky s’s o’ b’s in that hemisphere are enjoying late Summer while we deal with ice)). Time to move on. Draw a rectangle, any rectangle. Draw a diagonal line from one corner to the one (diagonally) opposite. Now draw a line somewhere within the rectangle parallel to one pair of edges. At the point where it crosses the diagonal, draw a line parallel to the other pair of edges. What you have now created is two rectangles whose proportions are similar to the base rectangle. That is to say they have the same ratio of height to width. Any rectangle whose diagonal is parallel to the diagonal of the base rectangle and whose sides are also parallel to its sides will have the same proportions. Construct a line perpendicular to the diagonal of any rectangle through either of the other 2 corners. From the point where that line hits the edge of the rectangle draw a line across the rectangle parallel to the sides that are perpendicular to that edge. The line perpendicular tot he first diagonal is the diagonal of the new rectangle you have just made. that rectangle has the same proportions as the first rectangle, but is rotated 90 degrees. Any rectangle with the same diagonal and edges parallel to the base rectangle has the same proportions. Those things work for any rectangle. Some rectangle have special properties. Try that with the “golden rectangle” and you will see( I do have faith in you grasshopper). 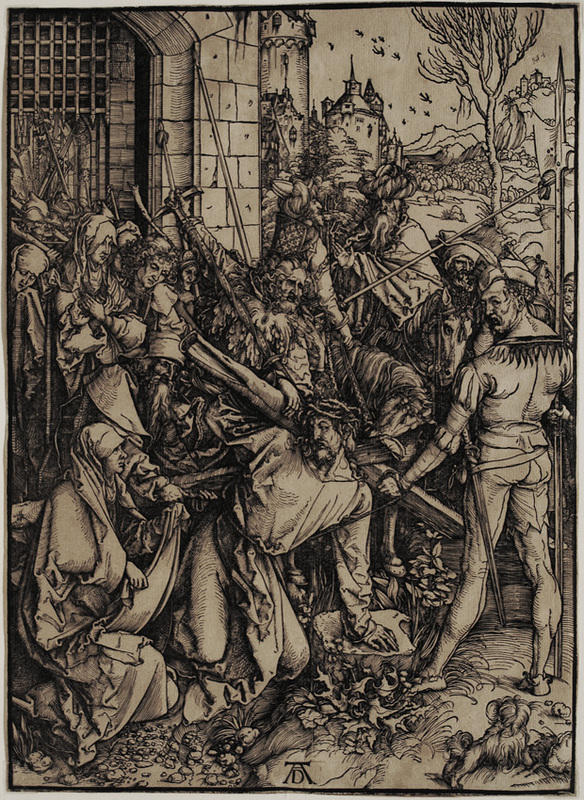 Look at the Durer engraving I linked to earlier. Draw diagonals and perpendiculars to those diagonals. Draw lines parallel to the edges where they cross. Subdivide in the same fashion. Once you start to do that you should be able to see the geometrical framework the whole series was based upon. It may take work and I’ll gladly help you to see, but once you do a whole new world opens up. You now have the key to the vast majority of Western art from the last 500 or so years and maybe more. Well, one of the keys since things are never so simple and why and how aren’t the same question.